Hanoi (VNS/VNA) – The State Bank of Vietnam (SBV) is drafting a new circular regulating credit institutions’ trading and handling of non-performing loans (NPL) with the aim of forcing the institutions to focus more on bad debt settlement. 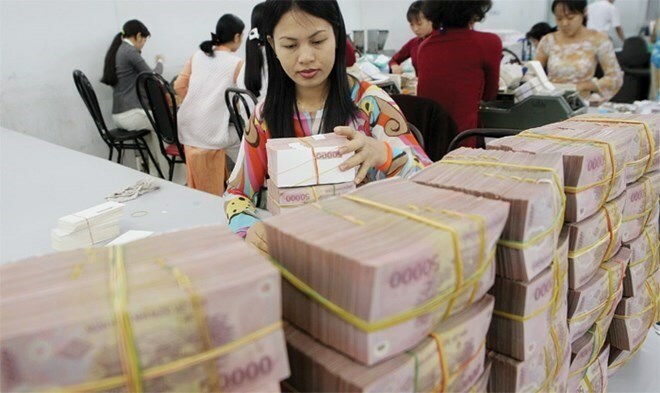 Under the draft, private credit institutions, which still hold special bonds issued by the Vietnam Asset Management Company (VAMC) – meaning they have not settled bad debts kept at the VAMC yet – will not be allowed to make dividend payments in cash. The fund must instead be used to handle bad debts and enhance the institutions’ finance status. Many credit institutions have sold their NPLs to VAMC for special bonds to lower their NPLs to below 3 percent of the total outstanding loans as required by the central bank. The special bonds are used only as collateral to secure funding from the central bank. The new regulation will not apply to State-owned commercial banks because under Decree 93/2017/NĐ-CP, dividend payouts of banks in which the State holds more than 51 percent of the charter capital still need approval from both the SBV and the Ministry of Finance. The move to draft a new circular was made after some private banks paid dividends in cash despite still holding VAMC’s special bonds. According to Can Van Luc, chief economist of the Bank for Investment and Development of Vietnam (BIDV), the draft regulation is necessary to promote the handling of bad debts. Credit institutions need to prioritise dealing with bad debts before paying dividends. The measure could help resolve bad debts more quickly, he said, explaining that credit institutions might use the capital to implement necessary measures to reduce bad debts. The draft circular also has conditions for bad debts to qualify to be purchased by VAMC with special bonds. NPLs and their collateral must be legal with valid documents and have no disputes at the time of trading. The SBV will focus on bad debt settlement this year to reduce the NPL ratio of the entire banking system, including NPLs sold to the VAMC, from 6.6 percent at the end of 2018 to below 5 percent by the end of this year. The development strategy for the banking sector to 2025, approved in August last year, also targets reducing the ratio of bad debts to below 3 percent of outstanding loans by 2020. According to SBV Governor Le Minh Hung, the organisation has actively implemented policies to restructure the banking system and deal with bad debts. The central bank has issued directives requiring credit institutions to review and provide detailed roadmaps and solutions for settling their bad debts for each year until 2022.
Credit institutions have also been required to look for buyers for the debts they sold to the VAMC, while the VAMC has been asked to speed up the handling of bad debts and collateral the company purchased following market-based mechanisms.